Well that was the silliest tea party I ever went to! I am never going back there again! Said no 4-year-old little girl ever! 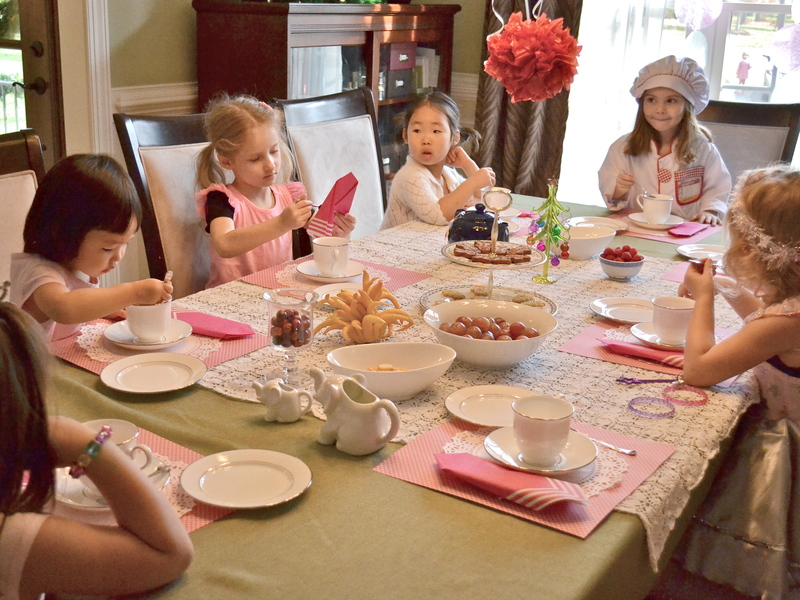 Last week, Gemma hosted five of her classmates at a special tea party playdate complete with mommy’s fine china and lots of sugar cubes. Oh, and an hour of dress-up time pre-tea! From the moment she hopped out of bed, Gemma was a ball of energy. She happily downed breakfast, helped me prep the table, and hopped into her leotard with no foul or fuss to await her friends’ arrival. Aside from the girls in her class, we also had the pleasure to visit with a few younger siblings and a group of great mama’s and grandma’s. It was wonderfully packed house as the girls tried on dresses and fairy wings and loads of jewels from the treasure chest. Gemma was a good host, letting her guests choose their accessories first, and finally settled on her chef uniform for her attire. There were puzzles, ponies and dolls strewn throughout the house, as the girls explored the playroom and kept busy entertaining themselves. However, it wasn’t long until the tea table, filled with cookies and fruits, beckoned them. So to the table we went! The girls got to select their tea flavor – either Passion Fruit or Baked Apple Cinnamon – and judging by their request for refills, I’d say their apple cinnamon choice was a hit…or maybe the sugar cubes kept their thirst alive! The girls were perfectly polite and it brought me great joy to see Gemma engage with her peers throughout the morning. As the adult host, I must admit I was amused overhearing the conversations between mothers and daughters as the elders asked the little ones to be very careful with the fine china tea cups and saucers. I had to admit to them I was not worried…considering I spent the night before taking price tags off of all but five settings. Needless to say, the cups and saucers were part of our wedding china set (we got hitched in 2005) and most had never been used before. Over the years I’ve adopted a rule to use it if we’ve got it…and in this case if I haven’t used them for my adult friends, Gemma might as well get some enjoyment out of them. It’s safe to say every little girl deserves a tea party with her best girls. And if you’re thinking of hosting a tea party yourself, I’ll share a few tips to help you prepare a fun, colorful and inexpensive partyscape for your special occasion. 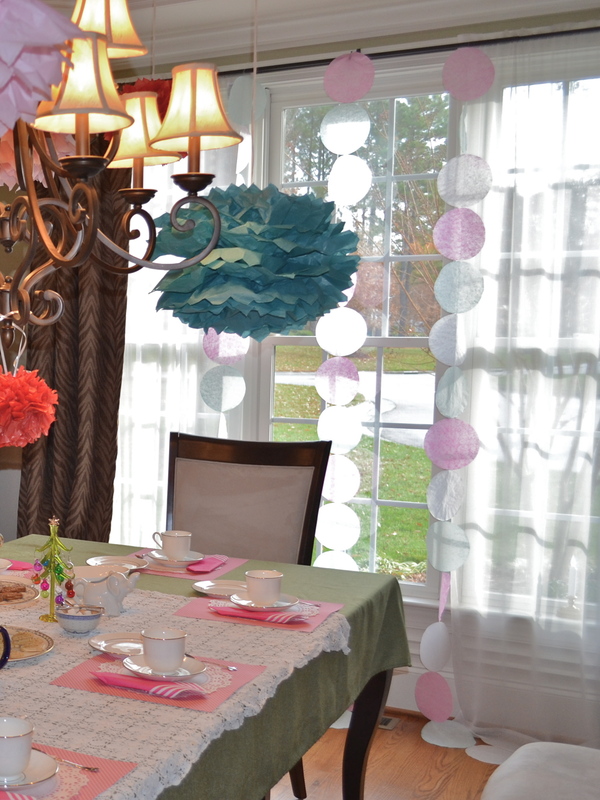 I’ve always wanted to make tissue paper poms and this tea party was the perfect excuse. I love the simplicity of the tutorial from Bramblewood Fashion blog. The author, Ashley, offers clear pics and instructions for fool-proof poms in just five easy steps. G and I chose red, pink and turquoise to compliment the holiday decorations we already have throughout the house. The easiest items of our crafty tablescape were the placemats. We simply placed paper doilies on sheets of scrapbook paper. Voila! The scrapbook paper lets you create any theme, color scheme or mood for your party. And if you don’t want the frill of a doily, place a smaller, solid-colored square of paper on top of the larger, patterned scrapbook sheet, and you have a modern alternative. Next time we plan a tea party, I’ll be sure to laminate these babies so we can reuse them. I’ll also give a shout out here to my grandmother, Lorraine (Weigelt) Schossow Black, who crocheted the white tablecloth I layered on my green cloth. She passed away in 2011, and I’m fortunate to have several pieces of her handiwork throughout my home. She was the original crafter in our family; she made cloths and doilies year-round and sold them at festivals and shows throughout eastern North Dakota. I have great childhood memories watching her work in her rocking chair and seeing her stretch the pieces on a large board to keep them taut for starching. This craft, along with many of her other talents (knitting afghans, playing the organ, making lefse and canning foods, are almost lost arts these days. 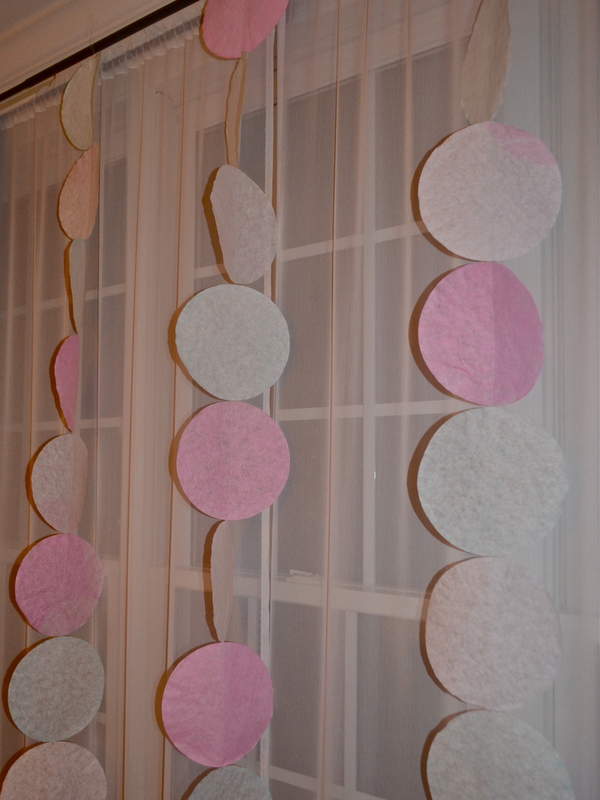 The last element of our DIY tea party decor was the coffee filter garland I hung in the window. My only regret was not making more to fill the windows. 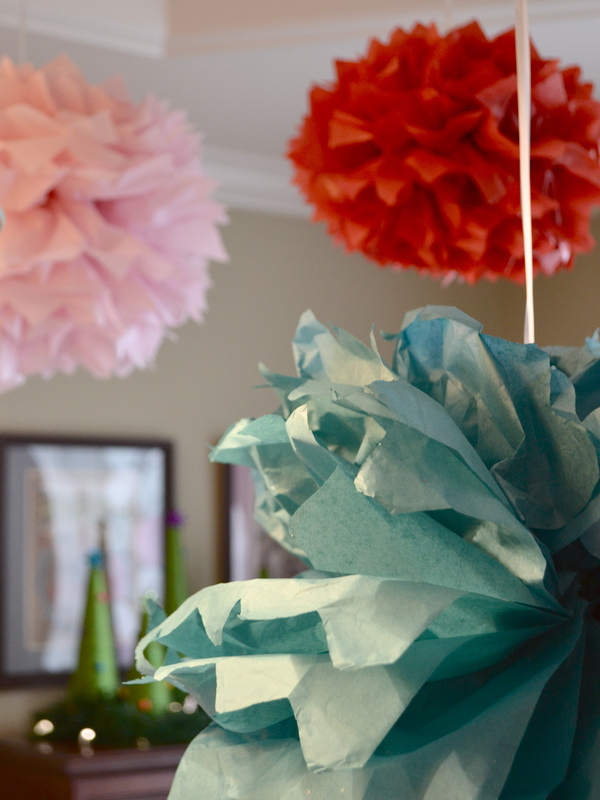 Coffee filters are great for party garland since they’re easy to find (probably in your kitchen now), inexpensive (in case they’re not in your kitchen now), and are built to withstand water (which makes for easy dyeing). The only con is they don’t absorb colors strongly…i.e. the colors are muted or pastel (perfect for baby or wedding showers), so keep that in mind if you try this at home. 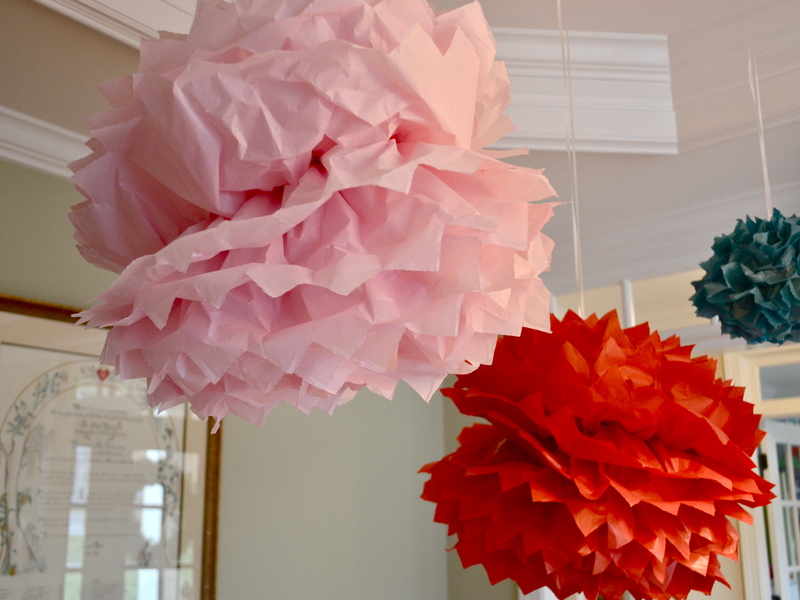 Here are 5 steps to create your own coffee filter garland. Step 1. Preheat oven to 175 degrees. 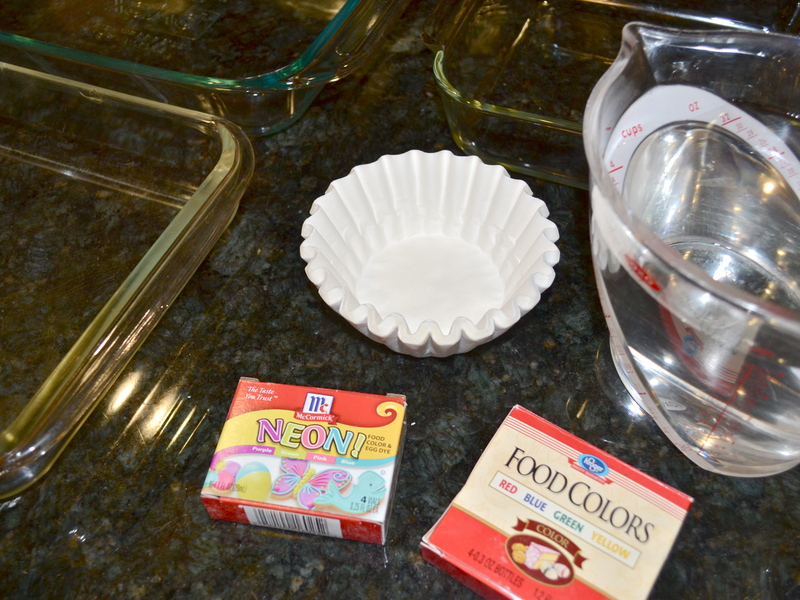 Place 2 cups of water in shallow baking pan/dish and add 8-10 drops of food coloring. Make a pan for each color you desire. 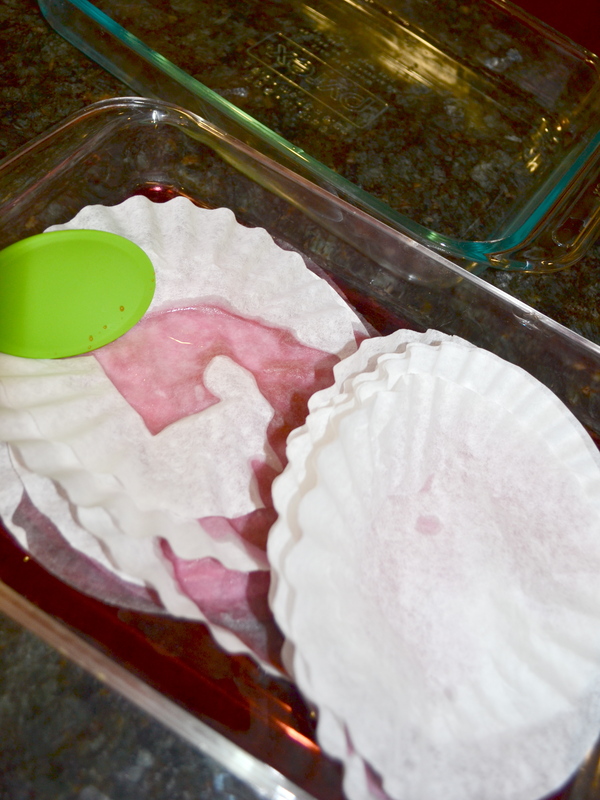 (or plan to reuse same container and dye each filter set individually). Step 2. Separate coffee filters and set each filter into colored water one at a time. Separate each filter from one another and add them individually; this will help you separate them later when you need to take them out and lay them to dry. Let the filters soak for 5-10 minutes until they absorb the level of color you desire. You may wish to add more food coloring to deepen the color; be sure to mix in thoroughly the additional color so your filters absorb the same color evenly. Step 3. Set a paper towel on counter, remove filters one at a time and lie them flat on your paper towel to allow excess water to drain from filter. I was able to lie four filters on each paper towel sheet with only a slight overlap at center edges. Repeat this step by placing a new paper towel on top of your previously removed coffee filters and keep stacking your filters between sheets of paper towels. I recommend starting a new stack for each color to avoid cross-color-contamination (lesson learned the hard way as my pink filters absorbed some of my turquoise color). Step 4. 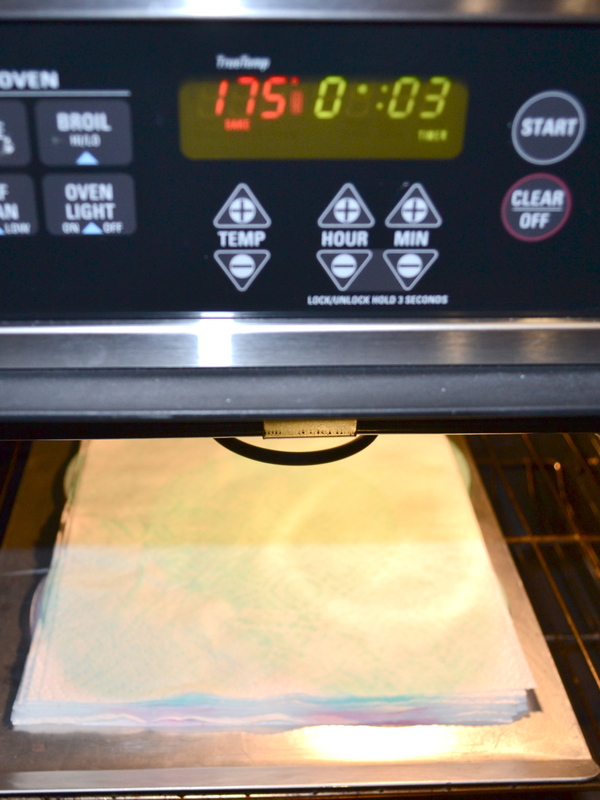 Place your paper towel/coffee filter stacks on a cookie sheet and place in oven for 8 minutes. The heat will help speed up the drying process. 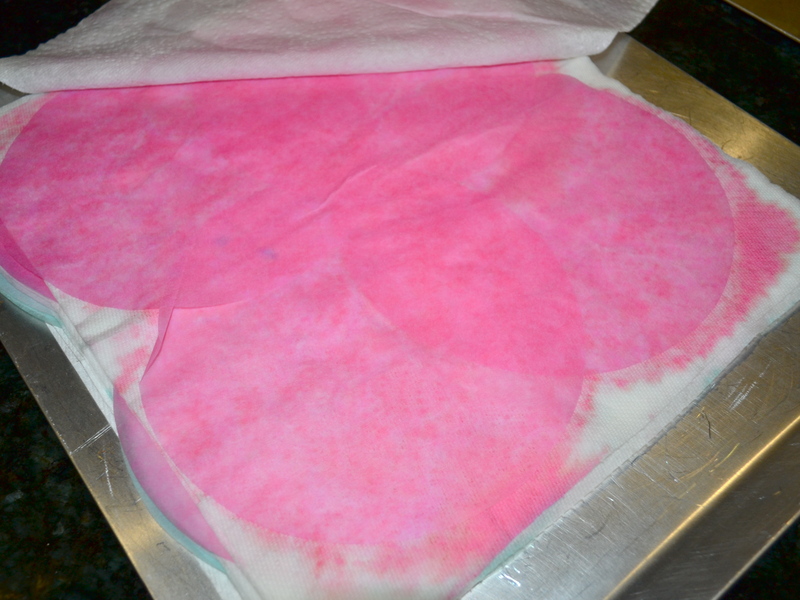 Remove cookie sheet from oven and remove filters from between paper towels. Lie filters on dry surface (I used my island countertop but a dining table would work, too). Allow filters to dry for 30 minutes. Step 5. Thread your sewing machine and place it on a straight-stitch setting. Let out 10-12 inches of thread before placing your centering your first filter under the needle; this thread can be used to tie your garland to a curtain rod or hook later. Sew straight across the center of your first filter then place your next filter (and each thereafter) as close as possible to the end of your previous filter and sew them together. 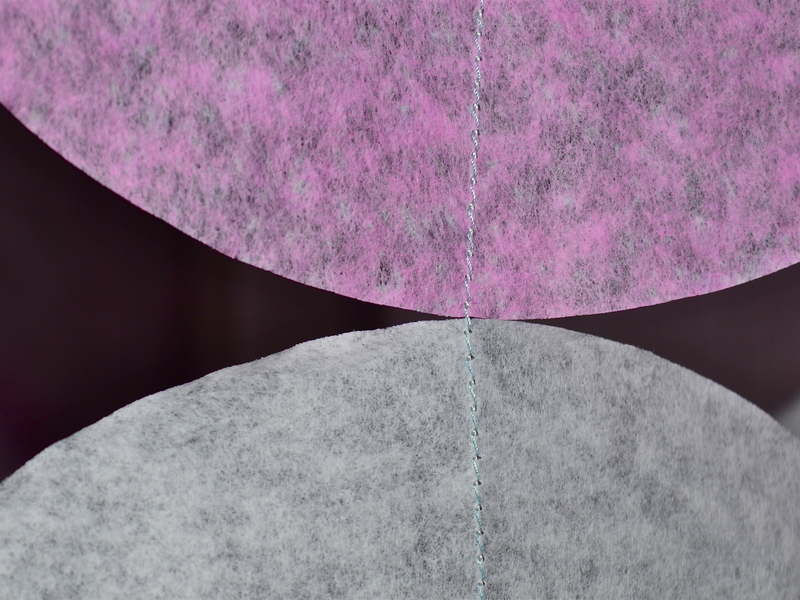 While the filters seem fragile, the paper fibers are strong hold up well to sewing. I had no issues with tearing or the presser foot bunching the filters on the feed dogs; if you have trouble with this you may try to adjust your tension slightly. If you are hanging your garland (as I did above), you should measure the length you’ll need to ensure your garland is long enough/not too long (mine was too long but I didn’t mind it wisping on the floor). 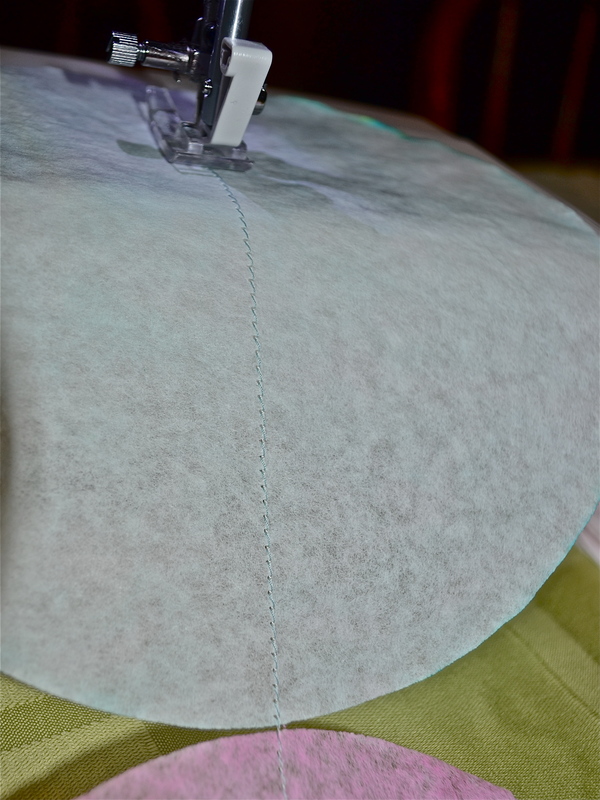 Since this garland is likely for one-time use, you need not worry about closing your last stitch (as that process might just be too much for the filter to withstand anyhow). For more tea party ideas, click here…..whatever did we do before Pinterest? !